Electronic and molecular structures of [(X)mMn (μ-oxo)2Mn(Y)n]q+ (X, Y = H2O, OH and O), which are Mn cluster models at catalytic sites of OEC, were studied by broken-symmetry unrestricted B3LYP method. Two paths from the S0 to S3 states of Kok cycle were investigated. One is a path starting from [Mn(II) (μ-oxo)2Mn(III)] at the S0 state, and another is from [Mn(III) (μ-oxo)2Mn(III)] at S0. Results found in this study are summarized as, 1) In [Mn(II), Mn(III)], it is not possible that H2O molecules coordinate to the Mn atoms with retaining the octahedral configuration. 2) The OH– anion selectively coordinates to Mn(IV) rather than Mn(III). 3) When the oxo atom directly bind to the Mn atom, the Mn atom must be a Mn(IV). From these results, the catalytic mechanism for four-electron oxidation of two H2O molecules in OEC is proposed. 1) The Mn4(II, III, IV, IV) at S0 is ruled out. 2) For Mn4(III, III, IV, IV) at S1, the Mn atom coordinated by OH– anion is a Mn(IV) not Mn(III). 3) Only Mn(III) ion which is coordinated by a H2O molecule at S0 plays crucial roles for the oxidation. Manganese atoms play important roles in the oxygenevolving complex (OEC) of photosystem II, the catalytic site for the four-electron oxidation of water to molecular oxygen such as 2H2O → O2 + 4e– + 4H+. Kok and co-workers have proposed, known as Kok cycle, that the oxidation proceeds through five states denoted as from S0 to S4 under four times of irradiation of light and remove of four protons . Recently, the structures of OEC have been reported by the X-ray crystallographic studies [2-5]. Four manganese atoms and calcium ion are present at the catalytic site. The manganese atoms and calcium ion are arranged in cubanelike geometry with Mn2O2 face of the di-μ-oxo-bridged [Mn(μ-O)2Mn]. The Mn-Mn distances were observed to be about 2.7 for Mn2O2 face [6-9]. As shown in Figure 1, three electrons and two protons are released from the catalytic site during the oxidation from S0 to S3. The molecular oxygen is formed from S3 through unstable S4 by releasing an electron and two protons. The oxidation states of the four Mn atoms at the S0 state have been suggested as Mn4(II, III, IV, IV) or Mn4(III, III, III, IV) [10-16]. Even if the oxidation states of four manganese atoms at S0 are different, the oxidation states change as Mn4(III, III, IV, IV) at the S1 state → Mn4(III, IV, IV, IV) at S2 → Mn4(III, IV, IV, IV) at S3 → Mn4(III, IV, IV, IV) at S4. However, the oxidation states of four manganese atoms and ligand state at S3 are still under debate. Two possibilities have been mostly discussed [17-22]: 1) Mn-centered oxidation; 2) oxidation of water molecule forming Mn-O or Mn-OH bonds as a direct Mn-ligand. In the 1990s, binuclear bis(μ-oxo)dimanganese complexes [(Lm)Mn(μ-O)2Mn( )] were prepared and characterized [23-33]. For many complexes, the ligands comprise biand/or tri-dentate compounds with lone pair electrons of nitrogen and oxygen atoms. The mixed valence [Mn(III)(μ–O)2Mn(IV)] complexes, which was expected to correspond to the S2 state of OEC, were intensively examined, since EXAFS and EPR studies suggest short Mn–Mn distance of ~2.7 Å and a multiline signal at g ~ 2, respectively [34-36]. It was thought from the spectroscopic studies of OEC that the catalytic site contains the [Mn2O2]3+ core. However, the process of H2O oxidation could not be recognized from the model complexes, since the models do not contain H2O, OH– and O2– (oxo) as ligands connecting directly to the manganese atoms. In accordance with experimental works, theoretical works of the [(Lm)Mn(μ-O)2Mn( )] complexes were performed by using density functional methods and brokensymmetry (BS) procedure for the low-spin states [37-39]. Figure 1. Schematic representation from S0 to S3 states corresponding to Kok cycle. Values in parenthesis denote total charge and spin multiplicity for high spin states. The [Mn(III)(μ-O)2Mn(IV)] complexes were mostly concentrated to investigate the geometries and spin-spin coupling constants of two manganese atoms in order to compare with experimental observations [37-43]. 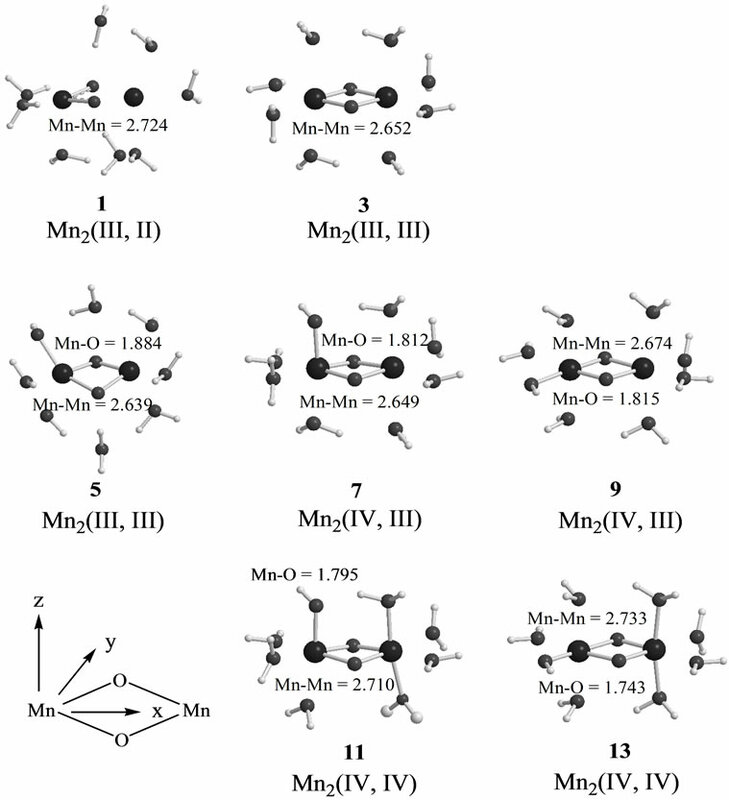 Small model [Mn(μ-O)2Mn] complexes where NH3, H2O and μ-oxo directly bind to manganese atom were also examined for the iso-valence Mn(II)/Mn(II), Mn(III)/Mn(III) and Mn(IV)/Mn(IV) and mixed valence Mn(II)/Mn(III), Mn(III)/Mn(IV) and Mn(IV)/Mn(V) [44-49]. However, these small models were discussed without strict relationship to the catalytic states in Kok cycle. [(H2O)4Mn(μ-O)2Mn(H2O)4] complex is a most fundamental model of the S0 state of catalytic site [49,50]. This model has the possibility to present the intermediate S1, S2 and S3 states where the proton(s) is(are) released from the H2O molecule. Figure 1 shows schematically the expected changes of the oxidation states for two Mn atoms and (total charge and spin multiplicity) of the Mn2O2 core through from S0 to S3 states in the Kok cycle. From the proposals that the oxidation states of four Mn atoms are assigned as Mn4(II, III, IV, IV) or Mn4(III, III, III, IV) at the S0 state, it is reasonable to assume that the oxidation states of two Mn atoms are Mn2(II, III) or Mn2(III, III) at S0. If we assume that the oxidation proceeds through the release of an electron from Mn atoms at each step, for the high spin state of Mn2(II, III) at the S0 state, the electronic state changes as (1, 10) at S0 → (1, 9) at S1 → (2, 8) at S2. For Mn2(III, III), it changes as (2, 9) at S0 → (2, 8) at S1 → (3, 7) at S2. It is apparent that the S2 state of Mn2(II, III) series is perfectly same as the S1 state of Mn2(III, III) series. For the S2 → S3 transition, (2, 9) and (2, 7) are possible at S3 for the Mn2(II, III) series, while (3, 8) and (3, 6) are possible for the Mn2(III, III) series. At this stage, the spin state of Mn2 depends on the electronic structure of the formed Mn-O and Mn-OH bonds. To our knowledge, the experimental and theoretical studies of [Mn(μ-O)2Mn] complexes with direct Mn-OH bonds are not found. In our previous work , we focused on geometries and electronic structures of binuclear manganese complexes, [(H2O)3Mn(-O)(μ-O)2Mn(OH2)4]q+ (q = 2 and 3), in which μ-oxo directly binds to Mn atoms as model complexes of the S3 state. Investigated in the present work are geometries, energetic and electronic structures of the high and low spin states of the [(H2O)4Mn(μ-O)2Mn(OH2)4]q+ (q = 1 or 2) complexes corresponding to S0, [(H2O)3(HO)Mn (μ-O)2Mn-(OH2)4]q+ (q = 1 - 3) to S1 and S2, and [(H2O)3 (HO)-Mn(μ-O)2Mn(OH)(OH2)3]q+ (q = 2 and 3) and [(H2O)2-(HO)2Mn(μ-O)2Mn(OH2)4]q+ (q = 2 and 3) to S3. Examination is performed by using broken symmetry density functional methods for the low spin (LS) state and usual unrestricted method for high spin (HS) states. The oxidation states of two manganese atoms are determined and the spin coupling constants in the complexes are estimated. Finally, the possible oxidation mechanism of H2O molecules at the catalytic site of OEC is discussed by combining the current results with previous results . Figure 2. Notation of OH-configurations in the complexes. Symbol (a, •) means that Mna on the left side is coordinated by OH in axial configuration and Mnb on the right side is coordinated by only H2O molecules. Symbols t and c means trans and cis configurations, respectively. t-(a,a), c-(a,a), t-(e,e), c-(e,e) and (e,a). For the [(H2O)2 (HO)2Mn(μ-O)2Mn(OH2)4] complexes, three (aa, •), (ee, •) and (ae, •) configurations are independent. The geometries of these configurations were fully optimized without any geometry constraints for the LS and HS states with all possible total charges shown in Figure 1. For the stationary geometries, the vibrational frequency analyses were carried out to confirm that the stationary point is a local minimum on potential energy surface. The usual unrestricted Hartree-Fock (UHF) method leads to poor estimations for the binuclear systems because of lack of the electron correlation effects in the transition metals. The hybrid exchange-correlation functional B3LYP method [51,52] was most widely used for the transitionmetal systems. Since the B3LYP method contains the moderate static correlation effects, we employed the B3LYP method to estimate the electronic structures. The usual unrestricted method was used for the HS states, while the broken symmetry (BS) method was used for the LS states. The Ahlrichs DZV  and 6-31G*  basis sets were employed for Mn atom and for O and H atoms, respectively. After the optimized geometries were determined, the single point calculations were carried out using the Ahlrichs TZV  basis set for the Mn atom. Mulliken population analysis was used to estimate the distributions of spin densities. In this report, energies and spin densities estimated by TZV are summarized in Tables. All calculations were performed using the Gaussian 03 program package . Here, is the spin angular momentum of the corresponding pure spin state ( ). If the spins in and are antiferromagnetically coupled, the values are nearly equal to unity with the relation of . Thus, the value represents the number of the antiferromagnetic spin couplings in the system. present the distribution of the electron spin localized on Mn atom. Thus, from and , the oxidation states of Mn atoms and characteristic of spin coupling between two Mn atoms can be easily determined. The MMOs are essentially same as the corresponding orbitals proposed by Amos and Hall . Although the BS solution suffers from the spin contamination, the projection to the pure spin state can be easily carried out by using the paired MMOs and . This equation can be rewritten by using the paired NOs and . Computational results for all optimized geometries are summarized in Tables S1, S2 and S3 as supporting materials. 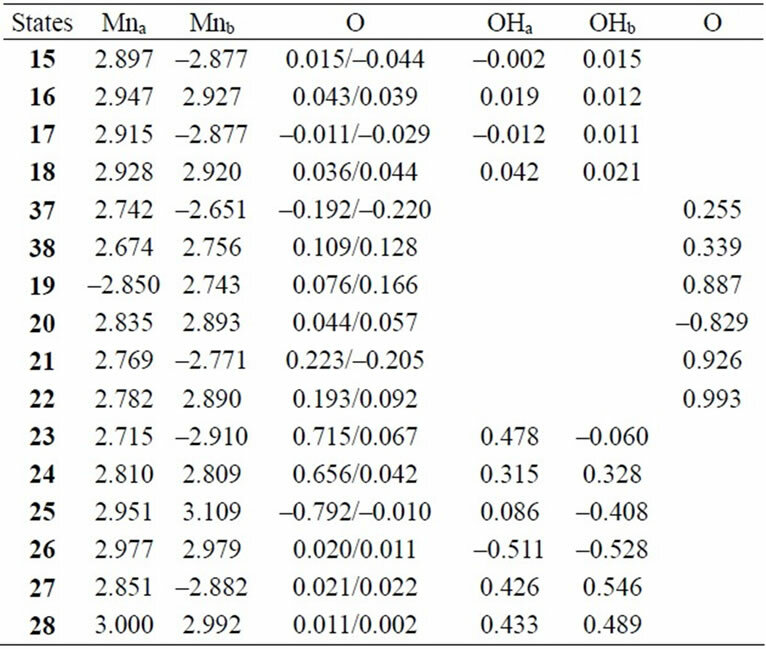 Table S1 summarizes the oxidation states, spin angular momentums and relative energies for all optimized geometries starting from Mn2(III, II) at the S0 state, while Table S2 summarizes the results for all optimized geometries starting from Mn2(III, III) at the S0 state. Table S3 summarizes the effective exchange integrals of the lowest LS states in energy. In text, low-lying configurations of them are discussed as well as the previous ones with the Mn = O bond . Figure 3 shows optimized geometries of LS states from S0 to S2 states derived from Mn2(II, III) and Mn2(III, III) at S0. The corresponding HS states have similar geometries to the LS states. 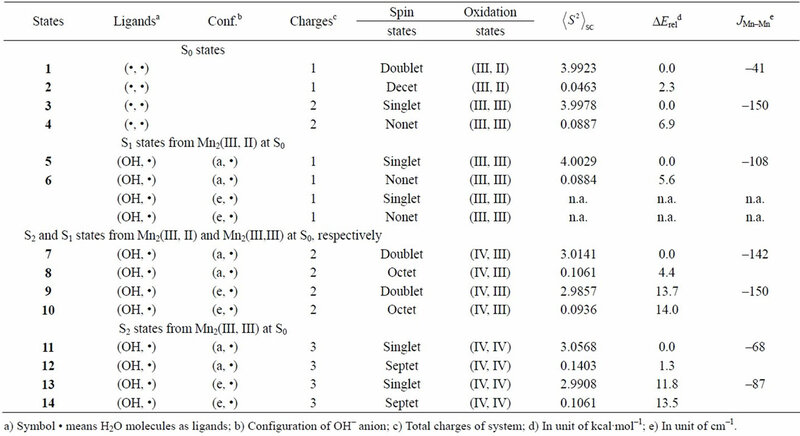 Table 1 summarizes the oxidation states of Mn atoms, spin contaminations, relative energies and spin coupling constants for the LS and HS states. Tables 2 and 3 summarize the selected interatomic distances and spin densities of selected atoms, respectively. Two LS states 1 and 3 are assumed to be Mn2(III, II) and Mn2(III, III) at the S0 state, respectively. 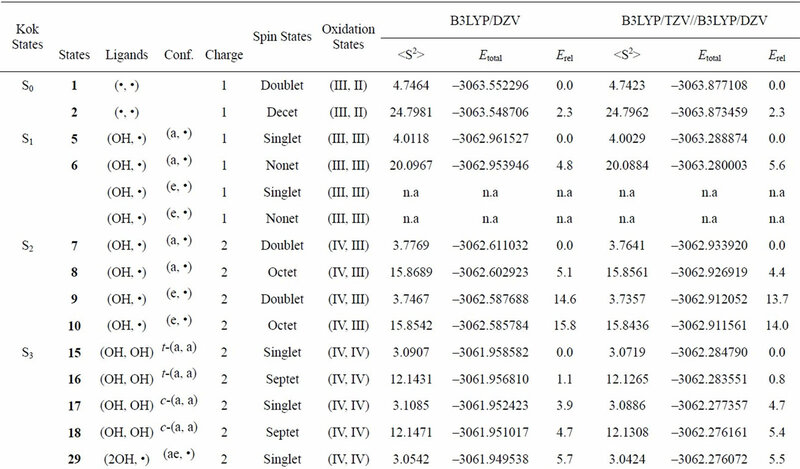 For the optimized state 1 in Table 1, = 3.9923 indicates that the doublet state 1 has four antiferromagnetic pairs of spins localized on two Mn atoms and the natural orbital analysis indicates that unpaired single spin is localized on the Mnb atom. Accordingly, the oxidation state of Mn atoms in the doublet state 1 is apparently assigned as Mn2(III, II). The oxidation state of Mn2(III, II) can be also confirmed by the spin densities of two Mn atoms, –3.783 and 4.715 e shown in Table 3. The Mn-Mn distance is given by 2.724 Å, comparable with 2.7 Å in the crystal structure of the active site of OEC. However, as can be seen from Figure 3, the coordinations of water molecules are remarkably deformed from octahedral configuration of Mn atoms. Two μ-oxo atoms shift to the Mn(III) ion. 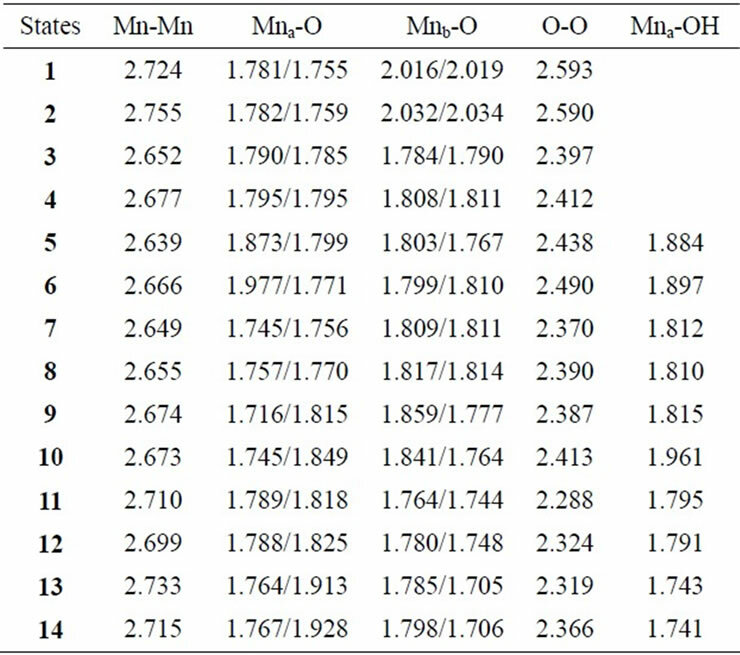 Differences of bond distances of Mn(III)-μO and Mn(II)-μO are given by 0.235 and 0.264 Å (Table 2). The decet state 2, which is 2.3 kcal mol–1 above the doublet state 1, has similar spin densities of 3.788 and 4.761 e on the Mna and Mnb atoms to the state 1, respectively, showing that the decet state 2 is obviously the HS state corresponding to the LS doublet state 1. Figure 3. Optimized geometries of LS states from S0 to S2 states derived from Mn2(II,III) and Mn2(III,III) at S0. Mn-Mn and Mn-O(OH) distances are shown in unit of Å.states. Tables 2 and 3 summarize the selected interatomic distances and spin densities of selected atoms, respectively. on two Mn atoms. Thus, the oxidation states of two Mn atoms in the state 3 are apparently assigned by Mn2(III, III). From Figure 3, the Mn–Mn distance is given by 2.652 Å, slightly shorter than 2.7 Å estimated by X-ray crystallographic study. However, coordination of water molecules is pseudo-octahedral configuration with high symmetry, in contrast with the doublet state 1 of Mn2(III, II). The corresponding HS state 4 is 6.9 kcal·mol–1 higher than the state 3. It can be predicted from the crystal structure of OEC that four Mn atoms are coordinated by pseudo-octahedral configurations. It is, therefore, expected that the oxidation states of Mn atoms at the S0 state is Mn2(III, III) rather than Mn2(III, II). In other word, it is thought that Mn4(II,III,IV,IV) at the S0 state in OEC can be ruled out. When single OH– anion coordinates to Mn atom at the S1 and S2 states shown in Figure 1, axial and equatorial configurations are possible. As shown in Figure 1, the expected oxidation states of two Mn atoms are Mn2(III, III), Mn2(IV, III) and Mn2(IV, IV). Obtained was the LS singlet state 5 shown in Figure 3, which is thought to correspond to the S1 state with Mn2(III, III) oxidation states. The ligand OH– anion is definitely deformed from axial configuration, although we set up an initial geometry in axial configuration before optimizing the geometry. Two Mn atoms are not strictly coordinated by H2O molecules and OH– anion in octahedral configuration. The OH– anion is located at middle position between axial and equatorial configurations. The Mn–Mn distance is given by 2.639 Å shorter than 2.7 Å of OEC. The BS solution of 5 has = 4.0029, indicating that the oxidation state of Mn atoms is Mn2(III, III), consistent with spin densities of 3.791 and –3.796 e shown in Table 3. We tried to obtain the optimized equatorial geometry of the OH– anion by starting from equatorial configuration. However, the equatorial geometry was not obtained by approaching to the geometry 5. 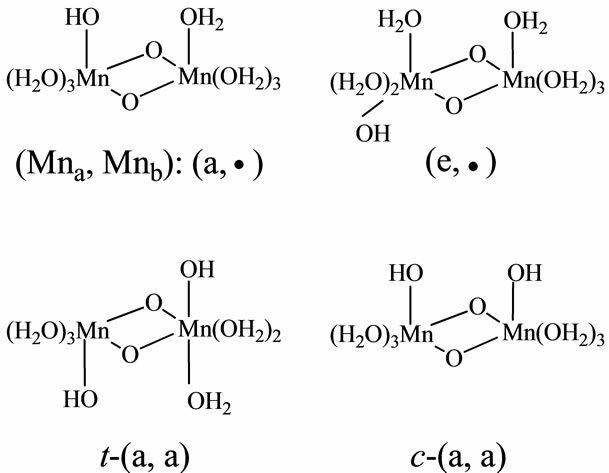 Accordingly, it could be considered from these results that the oxidation state of Mn atom coordinated by the OH– anion is not Mn(III), even the OH– anion is generated as an intermediate through the oxidation of water molecules in OEC. Reversely, the ligand coordinating to Mn(III) is not a OH– anion. Table 1. Oxidation states, spin contaminations, relative energies and effective exchange integrals of the optimized 1-14 states estimated at B3LYP/TZV//B3LYP/DZV level. Table 2. Selected interatomic distances (Å) at B3LYP/DZV level. Table 3. Mulliken spin populations of Mn atoms, oxo-atoms and OH ligands estimated at B3LYP/TZV//B3LYP/DZV level. 7, 8, 9, and 10 shown in Table 1. Figure 3 shows the LS doublet states 7 and 9. The corresponding HS octet states 8 and 10 have similar geometries to the LS states 7 and 9. The optimized geometries retain the pseudo-octahedral configuration with Mn–Mn distances of 2.649 and 2.674 Å for 7 and 9, respectively. The states 7 and 9 have similar Mn-O(OH–) distances of 1.812 and 1.815 Å. From Table 1, the LS states are more stable by 4.4 and 0.3 kcal·mol–1 than the HS states for the axial and equatorial configurations, respectively. The axial state 7 is 13.7 kcal·mol–1 lower than the equatorial state 9. The values of 7 and 9 are, respectively, given by 3.0141 and 2.9857, indicating that three spins localized on both Mn atoms are antiferromagnetically coupled each other. From the spin densities shown in Table 3, single unpaired spin is localized on Mnb atom. Thus, the oxidation states of two Mn atoms are apparently Mn2(IV, III). The OH– anion coordinates to Mn(IV) not Mn(III). In the geometry of the LS doublet state 7, the H-atom of the axial H2O on Mn(III) ion faces to the O-atom of the OH ion, indicating the possibility that the H-atom of H2O transfers to the OH bond to yield the Mn(III)-OH. Figure 4 shows the energy change for the H-transfer from state 7. The total energy increases and any local minimum or transition state was not found on the potential energy surface. The spin densities of both Mn atoms do not change to maintain the oxidation states of Mn(IV) and Mn(III). At ROH = 1.6 Å, H2O and OH are formed on the Mn(IV) and Mn(III), respectively. We could not find the optimized geometries in which the OH– anion coordinates to Mn(III). In other word, the OH– anion selectively coordinates to the Mn(IV) ion in the case of Mn2(III, IV). 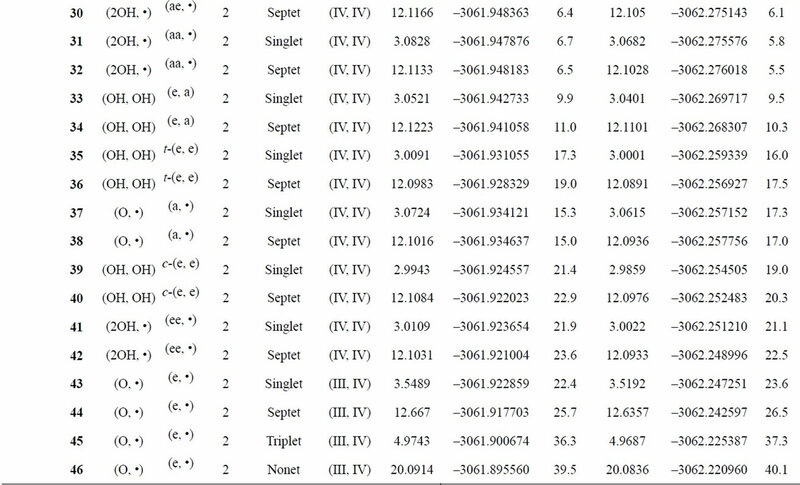 The optimized states 11 - 14, which correspond to S2 derived form Mn2(III,III) at S0, are summarized in Table 1. Figure 4. Energy change of H-transfer from H2O coordinating to Mnb to OH coordinating to Mna in the LS doublet state 7. Relative energies are estimated at B3LYP/DZV level. The geometries of the LS singlet states 11 and 13 shown in Figure 3 are similar to 7 and 9. Mn-Mn distances, 2.710 and 2.733 Å, close to 2.7 Å of the X-ray structure, are slightly longer than 2.649 and 2.674 Å of 7 and 9. 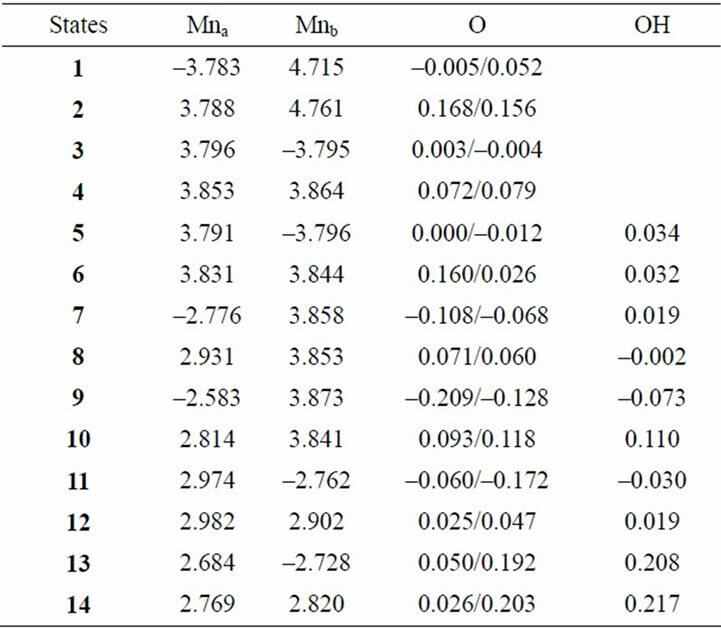 From the –values and spin densities (Table 3), it is apparent that the oxidation state of Mn atoms are Mn2(IV,IV) with three antiferromagnetic spin couplings. Similar to stabilities of 7 - 10, the LS singlet state of axial configuration is more stable than that of equatorial configuration and the LS states are more stable than the corresponding HS state. In summary, OH– anion can coordinate to the Mn(IV) ion rather than the Mn(III) ion with retaining the octahedral geometry. It is reasonable that this result will be retained in the OEC. Thus, It is expected that the OH– anion produced through the oxidation of water molecules coordinates to the Mn(IV) ion in the [Mn(μ-O)2Mn] plane of the OEC in axial configuration. The geometries were fully optimized for all possible configurations of the coordination of two OH– anions and all possible spin states. All optimized states of the S3 states derived from Mn2(III, II) and Mn2(III, III) at S0 are, respectively, summarized in Tables S1 and S2. The states with the oxo-ligand, which are previously discussed in ref. 49, are also listed in both Tables. The selected configurations are summarized in Table 4. Two lowest configurations in energy and oxo-ligation are selected for the S3 state from Mn2(III, II) at S0 and three lowest configurations for the S3 state from Mn2(III, III) at S0 are selected. Tables 5 and 6 summarize the selected interatomic distances and spin densities, respectively. As shown in Table 4, the LS singlet state 15 with t-(a, a) configuration of two OH– anions is most stable in energy. 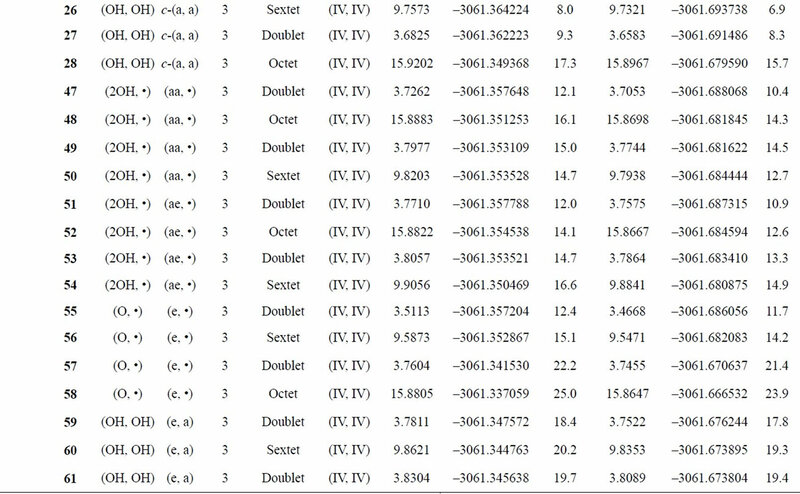 The corresponding HS septet state 16 is higher by only 0.8 kcal·mol–1, consistent with small J-value of –42 cm–1 shown in Table 4. As can be seen from Figure 5, the optimized geometry has pseudo-octahedral configuration with the Mn–Mn distance of 2.654 Å slightly shorter than the observed 2.7 Å in OEC. It is found from = 3.0719 shown in Table 4 that three antiferromagnetic spin couplings exist in the LS singlet state 15. From Table 6, the spin densities of Mn atoms are 2.897 e and –2.877 e, indicating that the oxidation states of Mn atoms are Mn2(IV, IV). Since the charge densities of two OHs are respectively given by –0.351 and –0.343 e with the spin densities of –0.002 and 0.015 e, two OHs are apparently OH– anions. The Mn-OH distances of 1.788 and 1.798 Å are comparable with 1.795 Å of 11 with the Mn2(IV, IV) spin configuration (see Tables 2 and 5). Table 4. 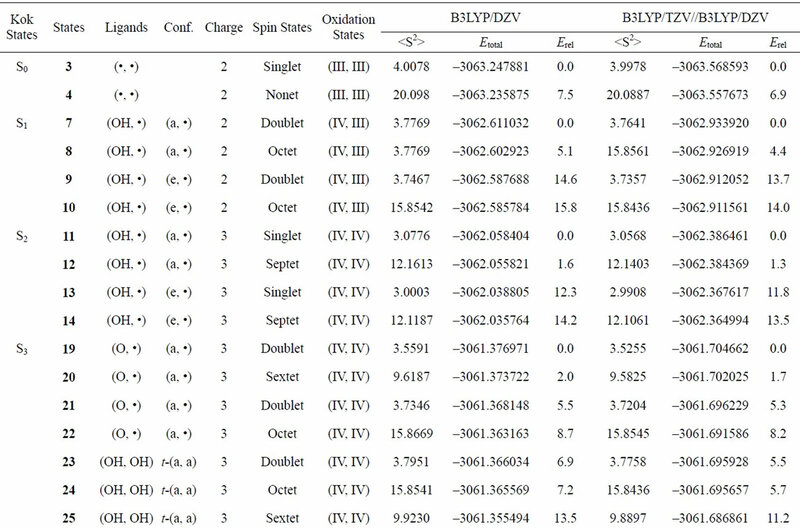 Oxidation states, spin angular momentums and relative energies of the optimized S3 states at B3LYP/TZV//B3LYP/DZV level. Table 5. Selected interatomic distances (Å) at B3LYP/DZV level. Table 6. Mulliken spin populations of Mn atoms, oxo-atoms and OH ligands at B3LYP/TZV//B3LYP/DZV level. Figure 5. Optimized geometries of LS states in S3 states derived from Mn2(II,III) and Mn2(III,III) at S0. MnMn and Mn-O(OH) distances are shown in unit of Å.
oxidation state that can be confirmed from = 3.0886 and the spin densities of 2.915 and –2.877 e. This singlet state 17 is perfectly same as the singlet state 15 shown in our previous paper (ref. 49). As discussed in ref. 49, the state 17 is immediately formed from the singlet state 37 (1 in ref. 49) that is a transient state on the potential energy surface and not a local minimum. These S3 states are produced by removing one proton and one electron from the S2 states derived from Mn2(III, II) at S0, as shown in Figure 1. The most stable state 7 with the (a, •) configuration leads to the geometries 15 and 17 with formal Mn(III)-OH– bond by removing one proton from the axial H2O molecule on the Mnb atom. Subsequently, one electron is removed from the Mn(III) ion to give a Mn(IV)-OH– bond. This is reasonably consistent with fact that the OH– anion does not coordinate to the Mn(III) ion as found for the states 7 - 10, in Table 1. When one proton is removed from Mn(IV)-OH– bond, the geometry 37 with Mn(IV) = O2– bond is formed. The subsequent remove of one electron from another Mn(III) ion rather than the Mn(IV) ion occurs to give the singlet state 37. As discussed above, this 37 is unstable and a transient state on the potential energy surface. The S3 states under consideration corresponds to those in which one electron is removed from the S3 states derived from Mn2(III, II) at S0 which are discussed in the preceding section. However the stabilities and electronic structures are significantly different from the preceding S3 states. The most stable state is a LS doublet state 19 with axial configuration of oxo ligand in contrast with the t-(a, a) configuration of two OH– anions in the singlet state 15. The states, 19 - 22, are perfectly same as the states, 7 - 10, discussed in ref. 49. The oxidation states of Mn atoms in all states are Mn2(IV, IV) and the Mn-O bond character is formally presented as Mn(IV)-O–. Figure 6 shows the magnetic orbitals MMO 3 corresponding to the Mn(IV)-O– bond. These orbitals are composed of the in-phase and out-phase combinations of the bonding and antibonding orbitals of 3dyz(Mn) and 2py(O). The bonding characters of both orbitals MMO 3 are due to the larger weight of the bonding orbital. Table 7 summarizes the biradical indexes of the antiferromagnatically coupled orbitals. The biradical index of the MMO 3 is estimated to be 0.366, showing the definitely small biradical character, consistent with the bonding character of the MMO 3. Figure 6. Magnetic orbitals in which anti-parallel spins couple antiferromagnetically. Table 7. 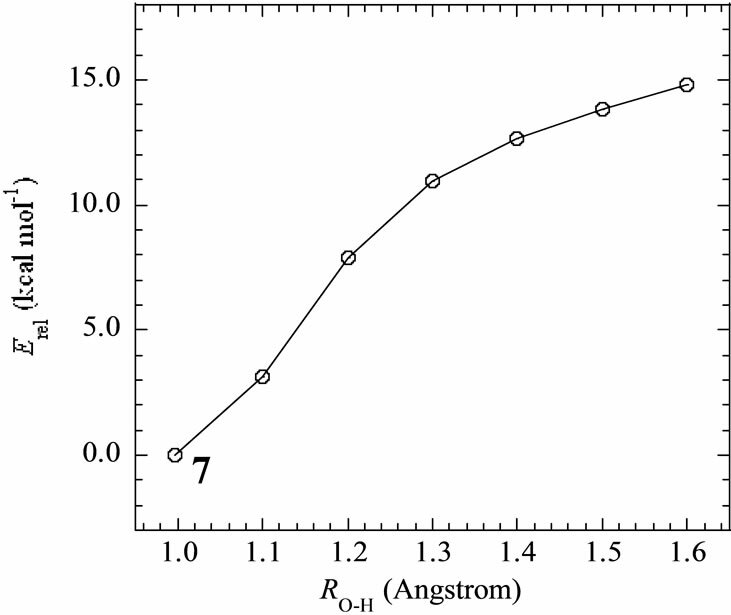 Biradical index and electron occupation numbers of antiferromagnetically coupled orbitals. spin coupling exist in the system. From the spin densities of two Mn atoms (2.715 and –2.910 e in Table 6), it is apparent that the oxidation state of Mn atoms is Mn2(IV, IV). In changing from S2 to S3 states through removes of one proton and one electron, it is natural to consider that each OH group is an anion and one electron is removed from Mn atom to yield Mn2(IV, V). However, our results show that the oxidation state on Mn atoms is Mn2(IV, IV) and one electron must be removed from OH– anion or oxo atoms binding two Mn atoms. As can be confirmed from Table 6, the spin densities of oxo and OHa anion are given to be 0.715 and 0.478 e, respectively. Their summation is equal to 1.193 e close to unity. Figure 6 shows the MMO 2 that correspond to the antiferromagnetic spin coupling including contribution from oxo and OHa anion. The orbital MMO + 2, which is occupied by a down-spin, is composed of the antibonding combination between the pz orbital on oxo and lone pair orbital on OHa. The MMO-2, which is occupied by a up-spin, distributes over the dyz orbital on the Mnb atom. The pure radical orbital (n = 1) is localized on another Mna atom. Thus, in the oxidation state of Mn2(IV, IV) of the LS doublet state 23, two spins on the Mn atoms are coupled antiferro-magnetically each other. The biradical index of the coupled orbitals MMO 2 is estimated to be 0.890 close to unity, showing the strong biradical character contrast with weak biradical character of the Mn(IV)-O– bond. As found in Table 4, the next higher energy state is 26 with the c-(a, a) configuration, which is only 1.2 kcal·mol–1 higher than the t-(a, a) configuration, 23. However, the state 26 is a sextet state, in contrast with the doublet state 23. The spin contamination 2>SC of the septet state 26 is given by 0.9821, indicating that one pair of the antiferromagnetic spin coupling exists in the system. From Table 6, the spin densities of 2.977 and 2.979 e of two Mn atoms shows that three spins are localized on each Mn atom. The spin densities of –0.511 and –0.528 e of two OH anions shows that single down-spin is delocalized over two OHs. It is expected that this down-spin is antiferromagnetically coupled with the up-spin of the Mn atoms. The Mn-Mn distance of the sextet state 26 is estimated to be 2.670 Å longer by 0.029 Å than the singlet state 17 with same cis configuration and Mn2(IV, IV). The Mn-OH distances are also longer than those of 17. Although one OH forms a hydrogen bond to another OH in 17, the O-O (in OH– anions) distance of 26 is given by shorter 2.071 Å and two OHs make the face-to-face conformation. Then the state 26 has a slightly deformed pseudo-octahedral conformation, as can be seen from Figure 5. Figure 6 shows the orbitals MMO 1 corresponding to the antiferromagnetic spin coupling, which were obtained by linear combination of the natural orbitals using the occupation numbers of 1.433 and 0.567. The MMO-1 is delocalized over two OHs in antibonding manner of the vertical lone pair orbitals of OH. The corresponding MMO + 1 is composed of the antibonding character of the dxz orbitals on two Mn atoms. The lone pair orbital on OH is combined with the dxz orbital on Mn atom in bonding character. As found from Table 7, the biradical index is estimated to be 0.572, showing the small biradical character contrast with the strong biradical index of 0.868 of the sextet state 25 with the t-(a, a) configuration. This small biradical character is consistent with bonding character of the lone pair orbital and dxz orbital. In changing from S2 to S3 state, one electron is removed from the formed two OHs with retaining the oxidation state Mn2 (IV, IV), not from the Mn atoms. Figure 7. Proposal of reaction mechanism of oxidation of H2O molecules from S0 to S3 states catalyzed by Mn cluster in OEC. 27 is perfectly same as the state 17 in ref. 49. As discussed in ref. 49, the state 27 is 8.3 kcal·mol–1 higher than the state 19 (7 in ref. 49). The activation energy is estimated to be 14.2 kcal·mol–1 for the H-transfer from 19 to 27. The molecular and electronic structures of the model system, [Mn(μ-O)2Mn], corresponding to the states from S0 to S3 along the Kok cycle, have been investigated using the density functional method. Several rules can be enumerated from our results in this study. 1) In the combination of Mn(II)-Mn(III), the Mn atoms do not keep the octahedral structure as can be seen from Figure 3. Accordingly, it is thought that the Mn(II) ion does not exist at the S0 state in OEC. 2) In the combination of Mn(III)-Mn(III) coordinated by OH– anion, the octahedral structure is remarkably deformed. In the Mn(III)-Mn(IV), the OH– anion selectively coordinates to Mn(IV). Accordingly, it is thought that the OH– anion coordinates to the Mn(IV) ion in OEC. 3) When the oxo atom directly bind to the Mn atom, the Mn atom must be a Mn(IV) ion. It is possible from these results to propose the reaction mechanism of oxidation of two H2O molecules from the S0 to S3 states in the OEC, as shown in Figure 7. It is known that the spin state of the S2 state is a low spin state with S = 1/2 [60,61]. Following the reverse path from S2 to S0, it is considered that the spin state of the S0 state is S = 1/2. Although it has been suggested that the oxidation states of the Mn atoms at the S0 state are Mn4(III, III, III, IV) and Mn4(II, III, IV, IV), both have the spin state of S = 1/2 as can be seen form Figure 7. However, from above rule 1) the H2O molecules coordinate to the Mn2(III, IV) rather than the Mn2(II, III) in the case of the Mn4(II, III, IV, IV). Accordingly the Mn(II) ion cannot be considered to exist in OEC, indicating that the Mn4(II, III, IV, IV) can be ruled out. In the Ferreira’s structure , each Mn atom has rooms where the H2O molecules occupy in octahedral configuration. 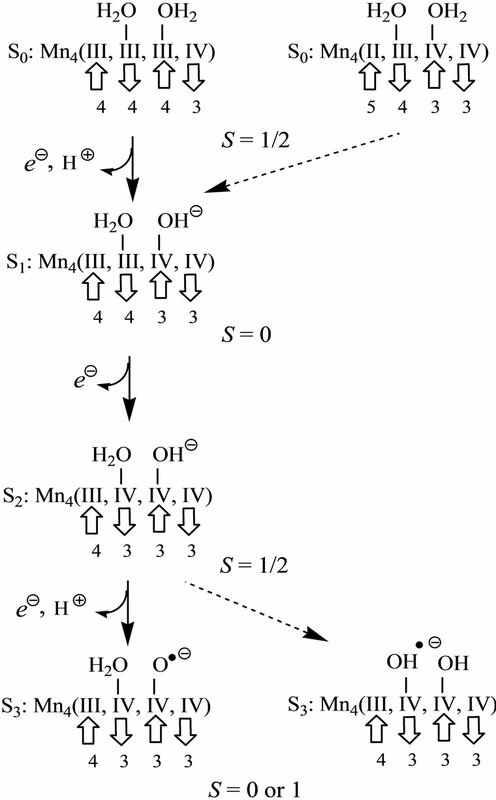 Thus, the oxidation state at the S0 state must be Mn4(III, III, III, IV). It is considered that the H2O molecule coordinated to Mn2(III, III) plays an important role of the oxidation in OEC. Even if the Mn4(II, III, IV, IV) exists in OEC, the H2O molecules must coordinate to the Mn(III) and Mn(IV) ions of the Mn4(II, III, IV, IV). At the S1 state, the OH– anion is formed by removing a proton from the H2O molecule. Since the formed OH– anion selectively coordinates to the Mn(IV) ion from above rule 2) one electron is removed to yield the Mn(IV) ion from the Mn(III) ion coordinated by the H2O molecule from which the proton is released. As shown in Figure 4, the reversible reaction, Mn(III)-OH2 + Mn(IV)-OH– Mn(III)-OH– + Mn(IV)-OH2, does not definitely occur. The spin state of the S1 state is given by S = 0, removing the up-spin from the Mn(III) ion. The S2 state is formed by removing one electron from the S1 state. Judging from the change from 7 to 11, one electron is not removed to yield the Mn(V)-OH– from the Mn atom of the Mn(IV)-OH–, but the Mn(IV)-OH2 is formed by removing one electron from the Mn atom of Mn(III)-OH2. Thus, the spin state changes from the singlet (S = 0) to doublet (S = 1/2) state. Further releases of one electron and one proton lead to the S3 state which is modeled by 19, 23 and 26 in this text. The doublet state 19, which is formed by change of Mn(IV)-OH– → Mn(IV)-O–, is more stable than the doublet 23 and sextet 26 states which have two OH– anions. Since the doublet state 23 has trans-configuration of two OH, it is impossible that this conformation is put in the cubic Mn cluster of OEC. Although the sextet state 26 with the cis-configuration can be put in OEC, it is 6.9 kcal·mol–1 higher than 19. Further problem is that the sextet state 26 has three spins on the Mn atoms in parallel alignment. The change from the S2 to S3 states does not continuously link due to the spin flipping. The doublet state 27 does not have the above problems, but the 27 has further high energy than the 26. Accordingly it is thought that the Mn(IV)-O– exists in the S3 state. In the changes from the S0 to S3 states, one of four Mn atoms plays important roles for four-electron oxidation of H2O molecules in OEC. The Mn(IV)–O– bond is formed by removing two protons and two electrons from the Mn(III)-OH2. The possible spin state of the S3 state is singlet or triplet. Considering that the O2 molecule in the triplet state is produced, the spin state of the S3 state would be triplet. Additionally the oxidation state of Mn(V) cannot be formed through the oxidation of H2O molecules in OEC. The problem which Mn atom of four atoms takes part in the oxidation has been left. In the Ferreira’s structure , the Mn atom which is most close to Asp61 and linked by the hydrogen-bonding to Asp61 is the branching Mn atom of Mn-μO-Mn. Presumably, these two Mn atoms will be reactive, as shown in Figure 7. This year, the X-ray structure at resolution of 1.9 Å has been published . Four Mn atoms are coordinated by ligands in octahedral configuration, while only one of four is coordinated by two H2O molecules. The Ca ion is also coordinated by two H2O molecules. One of two H2O molecules on the Mn atom is hydrogen-bonded to one of two H2O molecules on the Ca ion. These two hydrogenbonded H2O molecules might be substrates of formation of O2 molecule. From the above rules, the oxidation state of four Mn atoms must be Mn4(III, III, III, IV) at the S0 state. It is expected that H2O molecule on Mn atom is oxidized to yield the Mn(IV)-O– bond at the S3 state. This proposal for OEC at 1.9 Å resolution consistently matches with the results of our trial calculation using the structure at 1.9 Å resolution . Another problem is a Ca ion in the cubic form of the catalytic site. It was proposed that it is involved in the oxidation mechanism of two H2O molecules. Even if the Ca ion is involved in the oxidation mechanism, the H2O molecule coordinated to the Ca ion might be oxidized at the stage of the S4 state. However, the proposal for the Ca ion has not been established yet. This work was supported by the Grant-in-Aid for Scientific Research (No. 22550010) from the Ministry of Education and Science, Japan. Y. Y of the authors would like to thank Prof. Kizashi Yamaguchi for providing the new structure of OEC and fruitful discussion. Ruiz-García, R., Pardo, E., Muñoz, M.C. and Cano, J. (2007) High valent bis(oxo)-bridged dinuclear manganese oxamates: Synthesis, crystal structures, magnetic properties, and electronic structure calculations of bis(μ-oxo)dimanganese(IV) complexes with binucleating o-phenylenedioxamate ligand. Inorganica Chimica Acta, 360, 221-232. Gaussian 03, Revision B.05, Frisch, M.J., Trucks, G.W., Schlegel, H.B., Scuseria, G.E., Robb, M.A., Cheeseman, J.R., Montgomery, Jr. J.A., Vreven, T., Kudin, K.N., Burant, J.C., Millam, J.M., Iyengar, S.S., Tomasi, J., Barone, V., Mennucci, B., Cossi, M., Scalmani, G., Rega, N., Petersson, G.A., Nakatsuji, H., Hada, M., Ehara, M., Toyota, K., Fukuda, R., Hasegawa, J., Ishida, M., Nakajima, T., Honda, Y., Kitao, O., Nakai, H., Klene, M., Li, X., Knox, J.E., Hratchian, H.P., Cross, J.B., Adamo, C., Jaramillo, J., Gomperts, R., Stratmann, R.E., Yazyev, O., Austin, A.J., Cammi, R., Pomelli, C., Ochterski, J.W., Ayala, P.Y., Morokuma, K., Voth, G.A., Salvador, P., Dannenberg, J.J., Zakrzewski, V.G., Dapprich, S., Daniels, A.D., Strain, M.C., Farkas, O., Malick, D.K., Rabuck, A.D., Raghavachari, K., Foresman, J.B., Ortiz, J.V., Cui, Q., Baboul, A.G., Clifford, S., Cioslowski, J., Stefanov, B.B., Liu, G., Liashenko, A., Piskorz, P., Komaromi, I., Martin, R.L., Fox, D.J., Keith, T., Al-Laham, M.A., Peng, C.Y., Nanayakkara, A., Challacombe, M., Gill, P.M.W., Johnson, B., Chen, W., Wong, M.W., Gonzalez, C. and Pople, J.A., Gaussian Inc., Pittsburgh, 2003. Contact to yyoshi. @chem.mie-u.ac.jp for Tables S1, S2, and S3. Table S1. Oxidation states, spin angular momentums, total energies (hartree) and relative energies (kcal·mol-1) of the optimized S0 – S3 states derived from Mn2(II, III) at S0 state. Table S2. Oxidation states, spin angular momentums, total energies (hartree) and relative energies (kcal mol-1) of the optimized S0-S3 states derived from Mn3(III, III) at S0 state. Table S3. Spin coupling constants (cm–1) between Mn and Mn based on the geometries of the optimized LS states.